I have to admit this is hands down my favorite hat that I have crocheted to date 🙂 I love the addition of the felt pieces and the way the bottom rim flips over to create the snout. In an effort to get this pattern to you before Christmas, I have only worked this up in 0-3 months size. But I am confident that the ears and antlers will work on the larger hats. The mouth portion doesn’t have a specific stitch count (I will explain more below), so that should work for larger hats as well. Ok, enough talk, here it is! Change color and continue with “snout” pattern as written below. Round 2: SC around until you get to towards the middle of the front of the hat. This is where you are going to make 7 DC stitches (be sure that the 7 DC are centered in the front because this is the start of the Reindeer snout), SC the rest of the way around, join to first SC. Round 3: Slip stitch around until you get the 7 DC, make another 7 DC, continue to slip stitch around the rest of the hat, join to first slip st, fasten off, weave in ends. Now flip the “snout” up and fasten it in place with a red button. – Create two in Honey color using H or J hook (the larger the hook, the bigger the ear). – Then create two more using an F hook and lighter colored yarn. Sew the smaller pieces into the inside of the ear. Then sew finished ears onto hat. Chain 5, SC in 2nd chain from hook and the rest of the way down chain, chain 1, turn. Row 2: SC across, chain 1, turn. Row 3: 2 SC in first stitch, sc in next 2, 2 SC in last stitch, chain 1, turn. Row 4-5: SC across, chain 1, turn. Chain 1 and SC around edges, fasten off and weave in ends. UPDATE 11-12-13: I have created a crocheted partner for the antlers and eyes! You can find those patterns HERE. Here is the downloadable template for the antlers and eyes. You will need to cut out 4 antlers from dark brown felt and one each of the eyes and eyeballs. The eyes should be cut with white felt and the eyeballs with black felt. I used 2-ply (separate your 4-ply yarn into 2-ply) brown yarn and a small tapestry needle to blanket stitch the felt antlers together. I stuffed them lightly with poly-fil before completely sewing it closed. I sewed them onto the hat, but if you want them to stick straight up, you might try using a pipe cleaner or floral wire in the antler and wrapped around the area where the antler meets the hat. The antlers on my hat do flop over a little when being worn. The black eyeballs were hand-sewn onto the larger white eye with 2-ply yarn and a tapestry needle using a regular straight stitch. And then the complete eyes were sewn onto the hat at a slight angle. I just hot back into crochet and I am loving this! Can't wait to try and make this one. I was just thinking the same thing but then I clicked the view in fullscreen and then I could print the frame! I hope that helps! Thank you so much for your generosity and for sharing your wonderful talent and patterns with us. God Bless You and your family. Thank you bunches and bunches, BIGGGG hug, my LindY Lou wants 1 so much, now I can make her 1.This is my favorite hat too and Lindy Lou's too. This is ADORABLE!! I also love how you used felt. Beyond cute, great job! Ok, you're hats are truly amazing. I shouldn't add more projects to my huge list but I can't help it- I HAVE to make this for my boys! Thank you for your awesome tutorials! I've already made the snowman hat for both of them and they're adorable! Thank you so much for yet another pattern. You do amazing work. I have never successfully crocheted a hat before. Not very good with deciphering simple instructions. I will try this, though I don't have the exact colour, because your instructions and pattern are very, very, comprehensive. BTW, this is a very, very cute Rudolph. Thank you so very, very much for sharing your talents. Thank you, Thank you, Thank you!!!! Love this!!!! I love, love, love this hat!! I definitely need to make this for my girls! I couldn't pin this fast ebough. Thank you so much for sharing. 🙂 Here visiting from The Frugal Girls. Love this! But did you really use Rust? In person the yarn looks very orange not brown? It looks a lot darker than your color does! I just had to double check for you because you got me thinking I might have had my yarn colors wrong 😐 I think you might be correct! I threw away the label for the ball of yarn I used, but now I am thinking it is Honey and not Rust. So sorry! I am going to have to confirm this next time I am buying yarn but I will make not of it in the pattern. Thank you for catching this! This would be a perfect present for our g'son. So cute! Thanks for sharing the pattern! I'm definitely pinning this! Stop it – this is ADORABLE!! love. That is so adorable!!! Love love love! Oh my goodness, Sarah! This is adorable!! Oh, I LOVE this!!! I think I'm going to make one for all my kids! Pinning!! i dont know what i'm doing wrong but i need to make it way bigger for adults! You Rock! My only granddaughter loves hats! I have made her at least three so far! I just know she will love this one too…however, it will have to wait till next year. I have an afghan I'm working on plus 3 rag quilts and 3 lap quilts…alll for Christmas!!!! You are very talented, thank you for sharing! Merry Christmas to you and yours. Pinning and featuring this week! Soooo cute! Thank you so much for sharing your creativity at Mom On Timeout. Hope to see you back tonight! I've made 2 of these hats and they both turned out great! I get so many compliments and it's awesome to say "thanks, I made it!". Thanks so much for the free patterns. Just a helpful hint. You should never, ever use buttons on children’s clothing because of choking hazards! I used felt instead. MUCH safer! This is one of the cutest hats I have ever seen! I'm featuring it today at Creations by Kara. Thanks for linking up!! Wow this Pattern is Great! all your patterns are amazing, I just learned to crochet recently and I always come here for ideas beacause they are so simple to follow and your directions are very easy to understand. Thank you for sharing your impressive talents. This is seriously adorable!! One of my favorite projects this week. You really know how to design with crochet. I love that you used felt for the ears. Thanks for sharing at Hookin On Hump Day! Thanks so much for sharing this at Artsy Corner! What a beautiful hat! Thank you for the pattern. What size hook are you using for the main part of the hat? I don't see it written in the pattern. Thanks! so i just finished making this reindeer hat in the child size using the exact same yarn and hook and have made several other patterns of yours and they have all come out the correct size however this one doesn't fit my 9 year old it fits my 21 month old. I am not sure if it is due to this hat being worked in hdc and the other patterns I have made of yours is done in dc either way is there any suggestions of where to add stiches to make it bigger without being to big and now i am wondering if i make the adult size will it be to small? please help!? Thank you for the pattern, Rudolph is so cute! Are there any other ways to download and print the antlers, I can't print them unless I buy a subscription to Scrbd. Thanks again! Most wonderful! I'm so thankful for those who share their talents with others and make the world a brighter place! So cute, love his face! I featured a link to your pattern on Moogly this morning: http://www.mooglyblog.com/holiday-baby-crochet-patterns/ Thanks for sharing it! Must one pay to download the pattern for the antlers? Does one chain at the end of Row 8 on the Toddler size? Round 8: 2 HDC in first stitch, HDC in next 8, Repeat around (60 HDC) . Thank you for your help. Hello. I LOVE this hat!! Unfortunately I am unable to view the pattern for the crotched antler and eyes… it goes to a page that is unavailable. Any suggestions??? I too tried to download the antlers and it took me to Scribd.com where I have to PAY to print out the antlers. Anyone else able to print them FREE? I just love this! Thank you so very much! Which hook do use for the hat? It may be there but I can't find it. The pattern was ridiculously difficult to download and print. I realize that you need to accommodate the advertisers, but many of the links do not go were they say they will go, but instead go to Kelly Blue Book, etc. This is misleading. I really appreciate your willingness to share this pattern, but I became very frustrated the the design of the site. What hook did you use for the hat itself? Ikeep seeing this asked over and over with no answer. What size hook did you use for the hat itself? You don’t specify. Thanks! Hi, this pattern is very lovely! I can’t wait to make it! Although, what size hook is used for the hat itself? Why can’t I print this without joining a membership?! I woukd have liker a stitch gauge and indication of what hook size to use. I needed to redo the cap as I guessed what hook size and it was too small. I enlarged the crocheted eye white part as the photo showed more white than the pattern made. So, I made up the beanie using an H 5 mm hook and the Vanna’s Choice yarn, I ended up starting with 6 hdc and increasing to 60 hdc. This hat fits perfectly on my 4 year Olds large sized head and my 9 year old daughter’s head perfectly. For the antlers it’s pretty easy to crochet them and they will stand up well. I also did hdc for the snout and did dbl for the 7 stitches. The snout looks great. 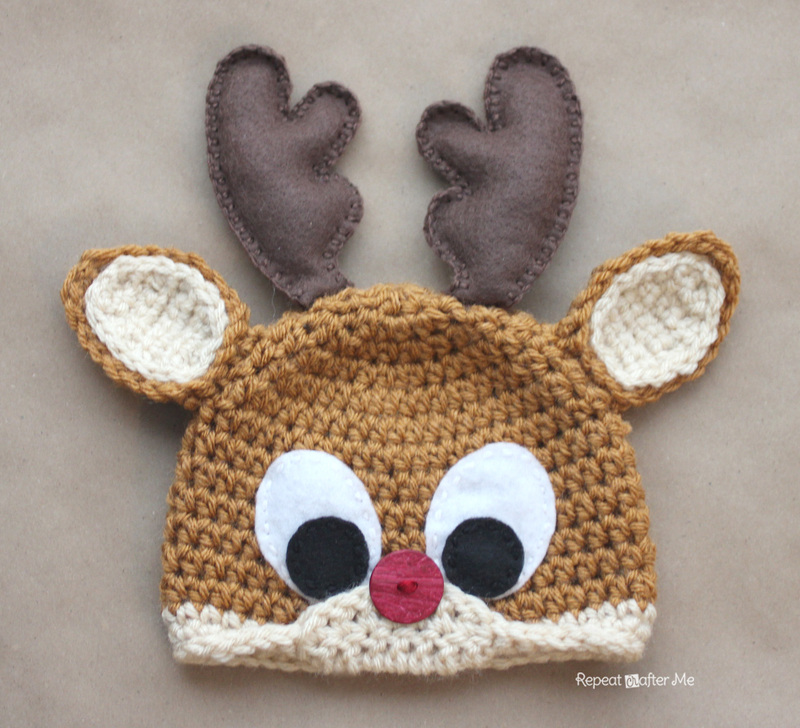 Just finished the rudolph hat and am using the same pattern but replacing the red nose with black and antlers for a bow to make a Clarice hat for my daughter. Thanks for the pattern! Sarah, thanks for the design, but a word of caution if you are starting this pattern…..I made the 6-12 month hat with a 5mm hook and it was WAY too small. I do wonder if it is something to do with using HDC as a stitch rather than a looser treble, as i also had problems sizing Sarah’s newborn knot hat, which is sc. in the end I made the child size reindeer hat, which was also too small for an 8month old. Soooooo I ended up putting in 2 increases in the first snout round and it finally fits. If I could’ve been bothered I would also have increased the size of the brown ear bit, because despite using a smaller hook for the beige, it’s still a bit big, but by this time I was rather loosing the will to live on this one! I notice Sarah hasn’t yet replied to any of the questions about hook size :o( but I think this is probably done on a 5.5 or bigger, maybe even 6mm hook. Anyway finally the hat itself looks amazing, I’m really happy with it. Thanks for the inspiration. I made the adult size with an H hook and worsted weight yarn. It is super tiny! It says that is should be 66 stitches around using hdc but the other pattern is use from this site is a dc with 68 stitches around for adult. Am I doing something wrong or is there is mistake? The newborn size worked up great though! Very cute. Really really confused. I’m on round 7, and all I have is a giant coaster (adult sized pattern) I’ve followed the pattern exactly. In the pattern you did not state where and when each size crochet hook was used????? A little confused???? Please please do a tutorial for the ears. I can’t seem to get them to look right.